VANCOUVER, BC, November 21, 2017 — Mirasol Resources Ltd. (TSX-V: MRZ, OTCPK: MRZLF) (the “Company” or “Mirasol”) is pleased to announce that it has signed an option and farm-in agreement (the “Agreement”) with Newcrest International Pty Limited, a wholly owned subsidiary of Newcrest Mining Limited (ASX: NCM) for Mirasol’s Altazor High Sulfidation Epithermal (HSE) gold project in northern Chile (the “Altazor Project”). NCM has the right to acquire, in multiple stages, up to 80% of Mirasol’s wholly-owned Altazor Project by completing a series of exploration and development milestones and making staged option payments totaling US$1.8 million to Mirasol. Newcrest Mining (“NCM”) is one of the world’s largest gold mining companies, operating 5 mines in Australia, the Asia – Pacific and Africa regions. NCM has extensive experience developing and operating successful mines in culturally and geographically diverse environments. NCM seeks to identify and secure large mineral districts, or provinces, in order to establish long term mining operations. Mirasol and NCM are preparing for an aggressive exploration program this southern Hemisphere summer season at Altazor comprising systematic soil sampling, CoreScan1 alteration mapping, detailed geological mapping, magnetics and electrical geophysics. At the end of the first year, NCM will have the right to exercise the farm-in phase of the Agreement. Stage 4: After completion of Stage 3, Mirasol can elect to contribute its proportionate share (25%) of further development expenditures or exercise a financing option requiring NCM to finance Mirasol’s share of the development costs through to production in exchange for a further 5% interest in the Project. If Mirasol exercises the financing option: (i) Mirasol’s interest will be reduced from 25% to 20% and NCM’s interest will be increased from 75% to 80%, and (ii) the loan will have an interest rate of 12 month LIBOR + 3% and will be repaid from 70% of Mirasol’s share of dividends and be secured against the shares of the Mirasol subsidiary that holds the interest in the Project and its right to dividends. The Agreement contains a 2% NSR dilution royalty (triggered upon dilution of a party’s interest to 10%), with a 0.5% NSR buyback right for NCM at fair market value. In the event that NCM should complete Stage 1, but elect not to proceed to Stage 2, then NCM’s 51% interest shall be adjusted to a 49% interest. In the event that NCM completes Stage 2, but elects not to proceed to Stage 3, then NCM’s 65% interest shall be adjusted to a 60% interest and the parties may agree to halt further exploration or continue and contribute in proportion to their interests or be diluted. After NCM has met the minimum commitment in the Option phase, NCM may terminate at any time without liability. Any expenditure incurred by NCM prior to termination will not be refunded by Mirasol. NCM may elect at any time after the Option phase to become the Manager, such election to take effect on 6 months prior notice. 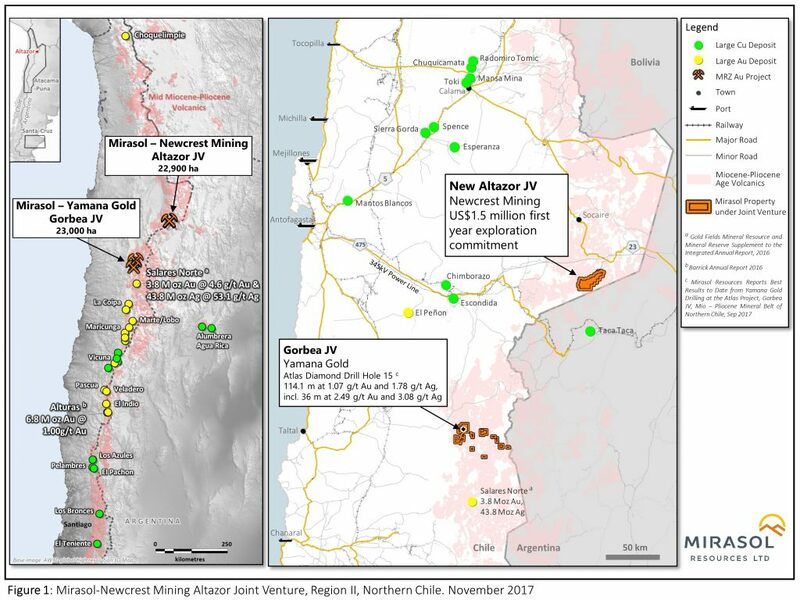 Altazor is a new 100% Mirasol owned, 22,900 ha HSE gold project, located in an underexplored section of the prolifically mineralized Mio-Pliocene age mineral belt of Northern Chile (Figure 1 and see news release October 11, 2017). Mirasol believes this belt to be highly prospective for the discovery of new world class Au+Ag deposits, as exemplified by the recent discoveries of the 3.8 million-ounce Salares Norte3 by Gold Fields and Barrick Gold’s 6.8 million ounce Alturas4 HSE gold deposits. Altazor is centred within a dacite to andesite composition volcanic complex hosting a very large-scale advanced argillic alteration system that may cover an area of up to 75 sq-km. Mirasol’s geological mapping has outlined a large phreatomagmatic to hydrothermal breccia complex currently known over approximately 5.0 by 1.8 km area with individual breccia bodies up to 700 by 350 m. Initial rock chip and soil sampling at the project has returned anomalous assays from the breccias, vuggy silica and siliceous veinlets that cross cut the breccia bodies of up to 562 ppb Au and 650 ppb Ag, with elevated epithermal path finder elements. Assays of this tenor are considered potentially significant in this geological setting in the context of the pre-drill surface sampling at Salares Norte5 . Mirasol is an premier project generation company that is focused on the discovery and development of profitable precious metal and copper deposits, operating via the joint venture business model. Strategic joint ventures with precious metal producers have enabled Mirasol to maintain a tight share structure while advancing its priority projects that are focused in high-potential regions in Chile and Argentina. Mirasol employs an integrated generative and on-ground exploration approach, combining leading-edge technologies and experienced exploration geoscientists to maximize the potential for discovery. Mirasol is in a strong financial position and has a significant portfolio of exploration projects located within the Tertiary Age Mineral belts of Chile and the Jurassic age Au+Ag district of Santa Cruz Province Argentina. Quality Assurance/Quality Control of the Altazor exploration program: All exploration on the project was supervised by Mirasol CEO, Stephen C. Nano, who is the Qualified Person under NI 43-101. 1 CoreScan is a ground based hyperspectral mineral mapping technology developed by the Australian CSIRO and now commercially available in Chile. 2 “Bankable” is defined as suitable to be submitted to a recognized financial institution as a basis for lending funds for the development of a mine. 3 Gold Fields. (2016). The Gold Fields Mineral Resource and Mineral Reserve Supplement to the Integrated Annual Report 2016. 4 Barrick Gold Corporation. (2016). Annual Report 2016. 5 Azevedo, F., Brewer, N., Santos, A., Huete Verdugo, D., Baumgartner, R., Roncal, L., Trueman, A. & Foley, A. (2015). The discovery and geology of the Salares Norte epithermal gold-silver deposit, northern Chile. In NewGenGold 2015 (p145-157). Perth, Australia.